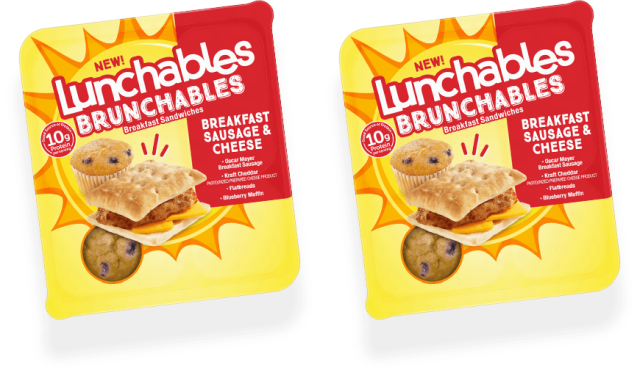 Lunchables tries breakfast again with the the launch of new Lunchables Brunchables. The new breakfast lines features build-your-own breakfast flatbread sandwiches paired with a mini blueberry muffin. They arrive starting this month at select retailers and come in three varieties: Bacon & Cheese, Breakfast Ham & Cheese, and Breakfast Sausage & Cheese. The suggested price for new Brunchables is $1.99 each. Lunchables previously offered a Lunchables Breakfast line that was eventually discontinued. It included breakfast stalwarts such as cinnamon rolls and waffles.